Johan’s current position is as Creative Director at RBK Communication, Stockholm, Sweden. Before joining RBK Communications in 2010, Johan was a Senior Art Director at Scholz & Friends. 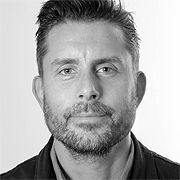 Altogether he has over 18 years of experience working as an Art Director for a number of agencies including Euro RSCG and Publicis Stockholm. Johan founded an advertising agency U.S.E in 2000 and a packaging company, Expericard, in 2004. He designs and produces books about graphic design and photography and has been published twice. Johan studied Strategic Planing at Berghs School of Communication in 2008, as well as Art History at Hong Kong University and Graphic Design at Rhode Island School of Design. Johan has earned numerous industry awards and nominations, including, Cannes Lions, Epica, Eurobest, and The Golden Egg (Sweden).